" A total breeze to use, Mapping Matter gives me a reliable evaluation of luminance and pix density, plus the visuals needed for focused discussion with stakeholders. " Save crazy amounts of time & resources by prototyping in real-time. Evaluate, calculate and create stunning Photometric Studies & Client documentation. Mapping Matter is a brand new Cloud-Based Platform allowing Technical Designers and their teams to effortlessly Plan & Simulate Large Scale Video Projection Layouts in a slick and simple 3D environment. 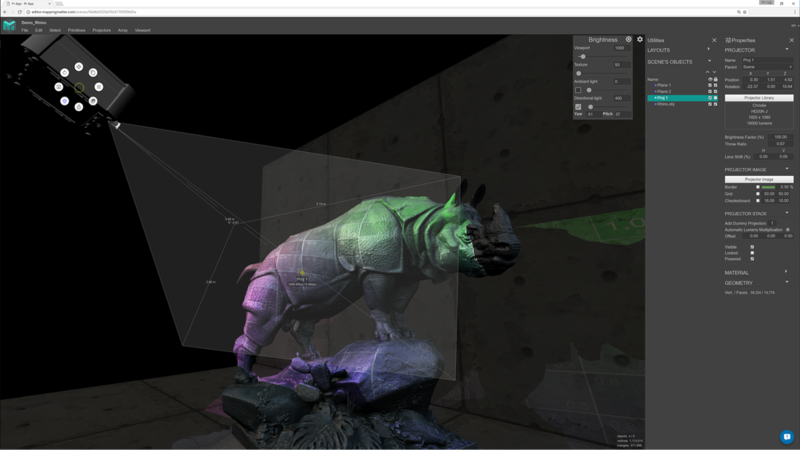 Watch your projections interact with other objects in a simple 3D environment. Import high-resolution Meshes and Textures and build advanced 3D simulations without having to know complex 3D softwares. All without installing anything. It works right from your Chrome browser. PROJECTION STUDIES, in real time. Quickly validate your projection brightness with the ​photometric analysis mode. This feature is just mind blowing. And if that's not enough, you also get the center pixel densities, while dragging the projection beam around in your screen. Generate the perfect client documentation in seconds. Add Annotations, Dimensions, export one of the camera views in photometric analysis with the luminance color scale or simply generate a nicely formated pdf projector specs list.